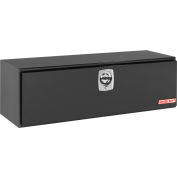 The rugged Underbed Storage Boxes are designed for heavy-duty trucks and semis to keep larger, heavy items and tools secure yet easily accessible. 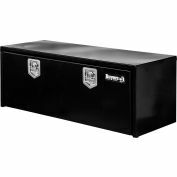 The Model 536-5-02 steel standard Underbed Box features a Black ARMOR-TUF® Powder Coat finish ensures years of dependability, Stainless Steel door and 6.2 cu ft. of storage. 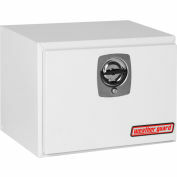 The 3-point latching system helps protect against theft and weather. Fits flatbed, platform or dump truck bodies. Door opening 14-1/2 in high, 34-3/4 in wide. 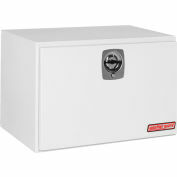 Aluminum door and hinge reduces box weight and protects against corrosion. 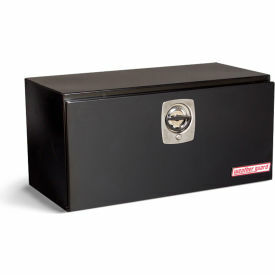 Rain gutter and full weather seal keeps moisture out of box and your equipment. Stainless Steel D-Handles are easy to grip, even with gloves on, and create a tight door seal. Tool-less quick release doors adjust from 90 degree to 180 degree with QuickClips, no tools required. 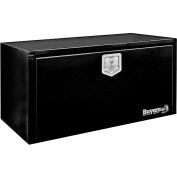 Heavy-duty three-point latching system means valuable supplies will be safe and protected. 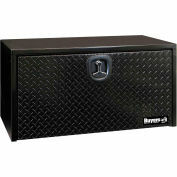 Black ARMOR-TUF® Powder Coat finish ensures years of dependability. Limited lifetime warranty ensures unparalleled quality.